I completed in 50 minutes. I highly recommend! Not sure if our school is right for you? Try us out for free with our start now pay later option. If you don't like it, you don't have to buy the course! Our online traffic school is based on an engaging, fun and easy-to-read course. You are in charge as to where and when to start and stop. Feel free to log on and off as you please and read through at your own pace. We are so confident that you will enjoy and PASS our California DMV Licensed traffic school that we offer an unconditional money back guarantee. 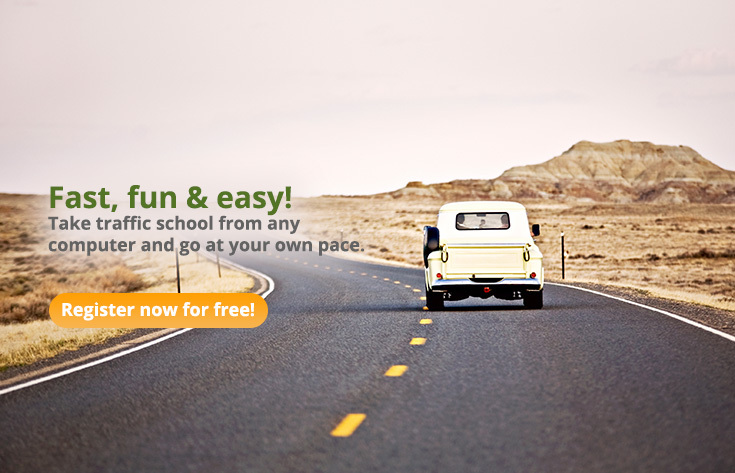 Take our online traffic school FREE by clicking START NOW, PAY LATER option at registration. You will only need to pay before taking final exam. When you complete, we will send to the DMV for you and in which you will recieve full credit with the Department of Motor Vehicles and the court where you recieved the ticket. Give us a call, our friendly support staff can help. Our company believes that the customer is always right.